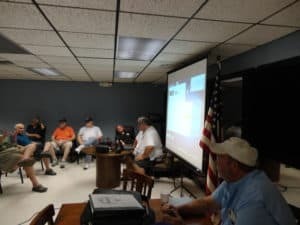 This is our first recap of the meeting as part of the project to move information that would have been in the club newsletter to the website. This is a high-level recap to share the general topics discussed along with some info about the particular presentation for that evening. This is not to be mistaken for the official club meeting minutes. That is available in the Club Business section of the website. Links to other websites, etc that may be relevant to the presentation will also be included here. Work continues on the repeaters with a new amplifier added to the 2m repeater along with the audio volume being increased. The repeater committee reports the repeaters are working and asked people to use the 220m and 440m repeaters more if they have the equipment. The club station performed well in the Florida QSO Party with many people participating to activate the W4S callsign. Bob N2ESP began a long discussion about Field Day involved asking what the membership wanted to do for Field Day. This discussion focused on a plea for participation from the members. The club needs people to stand-up and take action. Due to the normal 5 people being physically unable to do the work to put up antennas and stations, the club needs new people to get involved. The existing core crew wants people to help versus that core doing all the work. Field Day has been a social function with meals served but without more participation from the club members in the planning stage, Field Day will be scaled back to use the existing antennas and radios in more of a home station aspect than Field-style operating. The general feeling of those that usually participate was this is not optimal, but without more participation, this is a fact of life.The time to act is NOW. Email, call or use any other means to contact a club officers and say you want to commit to helping out on Field Day. The time for passiveness and just showing up is over. Without action, Field Day will not be the event the club has sone in the past. Tom NY4I wrote some items about Field Day but shared a plea that we are all amateur radio operators. He stressed the fact that we get out to Field Day and operate. The June program will be about Field Day (whatever effort the above plea warrants). July’s program will be a mobile installation contest. Members will park in the front of the DMI building car-show style, open up their car and judges will evaluate their installation. There will be a prize for the best HF and VHF/UHF installation. Entrants installations will be judged on neatness, effectiveness, safety, good engineering principles among other criteria. Look for a future post on the club website about this event. The program for May was by Tom Schaefer NY4I on interfacing HF radios with computers. The focus was the DXLab Suite of programs, but the information applied to any radios. Tom spoke of USB interfaces, serial interfaces and other tips on how to get your HF radio connected. Tom had an Icom 7300 setup as a demo and showed how one can click on a DX cluster spot to automatically tune the radio to the right frequency as well as using the information from the radio to fill in your log. Tom also demonstrated an Elecraft K3/0 which can be used for remote operation. This can be done with RemoteHamRadio or software available from RemoteHams.